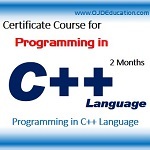 C++ is an object-oriented programming language that was first developed by Bjarne Stroustrup. It was originally created to be an extension of the C language, which is a middle-level language, and these roots are still present today. C++ can be developed in the object-oriented style, or in the C-style, making it a truly hybrid language. This path will take you from the very basics of programming using C++ and will vault you forward into creating rich applications for the Windows operating system. You can also create platform independent desktop applications in C++ using either the QT or Cinder frameworks. Those courses are in our library but not listed on this path.